Conneaut Township Park welcomes the D-Day event, its participants and its spectators. There are a few simple rules they ask us to observe. Do not drive vehicles (except for loading and unloading) in undesignated areas, such as the lawns and tennis court areas. Open camp fires are not permitted. Camp fires can be built in designated locations only. Contact event headquarters for locations. Please leave the park as you found it. Police your trash and personal goods throughout the weekend and as you depart the event. All reenactors, clivilian and military, must register. There is no onsite registration available. D-Day Conneaut focuses on June 6, 1944 along with the weeks leading up to and directly following the landings. Impressions are restricted to the ETO (England, France, Belgium, Germany) and Home Front from 1942 to June 6, 1944. Excluding educational materials and display boards, if it is not appropriate to the European Theater of Operations in 1944, or if you’re not sure, don’t bring it! Items of modern manufacture needed for basic health and safety (e.g. coolers) should be hidden from view during public hours and discreetly used otherwise. Tentage and camp equipment must represent items in use in the European Theater of Operations during WWII. U.S. GP Small tents are not permitted. U.S. GP Medium tents are permitted in certain locations. Ground cloths must be appropriate to WWII. Because of space constraints, D-Day Conneaut permits modern camping only for volunteer groups working at the event (e.g. CAP and boy scouts). Modern camping is available at several nearby camp grounds. Modern vehicles must be parked in the participant parking. No modern vehicle parking is permitted on site during the event weekend (Friday 0830h to Saturday 1700h) unless by special permit. There are NO exceptions. If you need your vehicle close by, we recommend purchasing a weekend parking pass from Good Shepherd Lutheran Church (funds support their youth group’s missionary work). Participant must police their own trash. Trash bags will be provided at the reenactor check in or Operations tent. All WWII era re-enactors representing Axis and Allied forces of Western Europe in 1944 are invited to attend D-Day Conneaut. ETO and Home Front impressions and displays are welcome and encouraged. Participants are asked to refrain from wearing and displaying items not documented to the European Theater of Operations or US homefront. Educational materials and display boards, as well as tagged or labeled items intended for spectator’s education are permitted. The event authenticity guidelines have been developed to help D-Day Conneaut attain the highest quality WWII representation and living history experience for spectators and reenactors. The success of the event depends on the efforts of the participants and their cooperation in abiding by the safety and authenticity rules. Your cooperation and positive attitude in meeting or exceeding the authenticity guidelines is greatly appreciated. In the rare event, if a participant chooses to ignore the safety or authenticity requirements, the event organizers reserve the right to request the participant to terminate their involvement in the event. Eastern Front, PTO, Political and Celebrity Impressions are not permitted at D-Day Conneaut. However, those wishing to do a Celebrity Impersonation of non-political persons may contact event staff to discuss the permissibility of their proposed impersonation. Dress and grooming should be consistent with 1944 Europe and North American standards. a. Clothing styles and ensembles should be appropriate to the wearer’s impression (See our other web pages for specific information on military impressions). Obviously modern body art (i.e. piercings or tattoos) is also not permitted and should be covered or removed. Men’s facial hair should be trimmed to be appropriate to the impression they are portraying. ALL tools, drinking vessels, utensils and other common items should look like or date to 1944 or before. Not Sure? Don't Bring It! Some WWII camp equipment and personal items were likely not to have appeared in the European Theater of Operations because of their date of manufacture (M-1945 Command Tent, M1944 Mermite containers). We consider these items “questionable” and request you to refrain from bringing them. If you have documentation for a specific “late war” item’s use in pre-Invasion England or the ETO prior to June 6, 1944 and would be willing to bring the information, we would be delighted to share in your knowledge. If you are unsure about the use or appropriateness of any of your items, please leave it at home. Modern footwear and sunglasses, post WWII uniform parts etc. are not permitted. A participant less than 18 years of age, but having reached their 16th birthday by the date of the event who desire to participate in D-DAY CONNEAUT tactical scenarios may do so IF and only if accompanied by their parent or guardian at all times. Their parent or guardian will willingly assume full responsibility and liability for the minor under their direct supervision. Participants under the age of 16 ARE PROHIBITED from taking part in the combat scenarios. If you are a medical professional licensed/certified to practice first aid or emergency care in Ohio, and would be willing to do so if needed during the event, please alert the commanding officer at your respective camp HQ. Unit commanders will be briefed on D-Day Conneaut’s system for determining a real medical emergency from a simulated one so that actual medical needs are not overlooked on the battlefield. Those reenactors wishing to bring period vehicles to the event, please click here for specific rules, restrictions, and information. Combat photographers and journalists, served an important role in documenting the history of the invasion and also took part in the events that followed the initial landing. 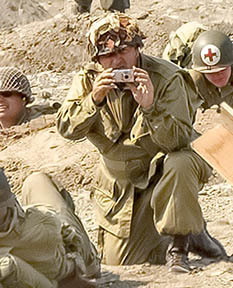 As many units appreciate photos of their members in action, photographers are permitted in the battle field with special restrictions. Photographers not already attached to a military unit will be assigned to one by the press officer, John Veglak. All persons in the landing zone will strive to meet the basic infantry standards described in the authenticity regulations. No un-uniformed or partially uniformed individual will be permitted on the battlefield. Historic photo equipment or "Historic-looking" equipment is required in all battles. If you use modern equipment disguise it. Using an empty period camera body is the preferred method of concealment. A non functional Speed-Graphic or other vintage camera can generally be obtained at a reasonable cost and most modern cameras will fit inside one. Unconcealed, modern equipment will not be permitted on the beach or any of our other battles. If you have creatively devised a way to conceal a video camera in such a way as it is not easily observed, it may be permitted. Please contact or see John Veglak for review and approval. We seek to avoid marring an otherwise authentic scene with the painfully obvious sight of a modern camera being freely and openly brandished. Still and motion picture photographers who participate in the beach landing are invited to submit their images to our public share gallery. Visit the "gallery"section for more information. This event does involves a simulated beach landing. Waterproof your gear accordingly. D-Day Ohio, Inc. is not be responsible for any damaged or loss to camera equipment or film. Please refrain from being tempted to take out your camera in the mists of battle. If you can see people, they can see you.... and your camera! D-Day has gathered a team of 7 professional photographers who will be canvassing the event to capture all the great action. Images from the event will be available for purchase from our gallery after the event for a modest cost. Proceeds from photo sales help support the event. If you would like a special "unit" picture or picture of your impression or set up, please feel free to flag down one of our team members or contact our photography coordinator, Wayne Heim. They will be more then willing to assist. Our team members will be dressed in WWII gear and will be identified by a badge and/or arm band. To provide the best possible pictures for our guests they will be carrying and using modern camera equipment. We ask reenactors however to keep their modern cameras concealed while wondering the camp. Even our team is not allowed into the battle field with modern gear exposed so please leave the camera in your tent. PLEASE NOTE: D-DAY CONNEAUT IS COPYRIGHT PROTECTED. IF YOU PLAN ON USING VIDEO FOOTAGE FOR PROFIT AND/OR THE D-DAY CONNEAUT LOGO AND NAME, YOU MUST OBTAIN WRITTEN PERMISSION FROM THE EVENT ORGANIZERS PRIOR TO USE. This does not prohibit taking photos or shooting live action video for your unit or their website. If you have questions regarding this, please contact our Media Committee Chairman.